An October update of my collection of free and paid apps that I use most often. Unless otherwise indicated all apps below are designed specifically for the iPad. Please comment and let me know what apps are important to you! Articles - So why pay for an app when Safari can browse Wikipedia for free? Article's design makes it a pleasure to read, navigate, and display articles. Pages display almost instantly. There is a table of contents of jump points for for most pages, which allows quick navigation throughout your page. 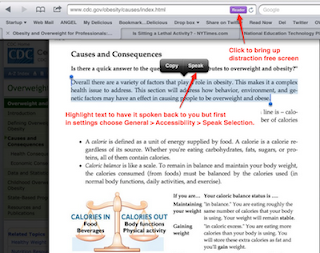 You can bookmark pages and manage them with a Safari like interface. Using the language picker pages can be translated quickly, which is a great learning tool for students. The WorldFactBook provides a colorful, icon rich interface to the completed CIA World Factbook, which is downloaded locally to your iPad for offline access. Content is updated once monthly. In addition to rapid navigation through more than 250 countries there is a Maps tab for major world regions that can be zoomed in for closer view. The addition of jump points from each of the countries to their description pages is missing however. The Comparison tab compares countries by a number of demographic indicators such as Infant mortality rate and Education expenditures. * To take a screenshot of your iPad screen press the power and home button at the same time, which saves the snapshot to the iPad's Photo Library. Slideshare completed converted its web site to HTML 5 http://www.slideshare.net/html5, eliminating the need for Flash to play slides on mobile devices. Although the mobile Webapp Slideshare is not as efficient and full-featured as a native app, the new HTML 5 version finally allows playing of Slideshare content! Dragon Dictation - Converts what you speak into surprisingly accurate text. The process is simple: press the recording button at the top of the screen and start speaking - slowly and distinctly with minimal background noise works best. Dragon Dictation processes and converts your speech through online servers and displays the converted text on your iPad screen, which you can either edit, copy, or e-mail. Although Dragon Dictation limits speech conversions to 60 seconds at one time, you can record more sessions to append and build text of a complete recording. You can separate sessions by creating new notes. Press the information button at the bottom of your iPad screen to bring up a help screen that provides tips for effective recording and shortcut speech commands to format your text (e.g. "next paragraph"). Additional tips are available at http://www.dragonmobileapps.com. Voice Memos – Not to be confused with Apple's own Voice Memos app, which is only available for iPod touch (2nd generation or higher) and iPhone. Although the app is not free (it costs $1.98 - $.99 for the app plus $.99 for the share memos add-on), it is elegant, easy-to-use, saves files as compressed .m4a audio files, allows simply text tagging, and export by e-mail and iTunes file sharing. E-mail exports are limited to approximately 20MB or 40 minutes of recording. Unlike Apple's native app Voice Memos cannot record in the background and does not provide a tool for trimming recordings on the fly. USAToday Reader. An app browser designed for elegance, stunning images, simple navigation that allows you to easily read the latest in USA News, Sports, Money, and Life. 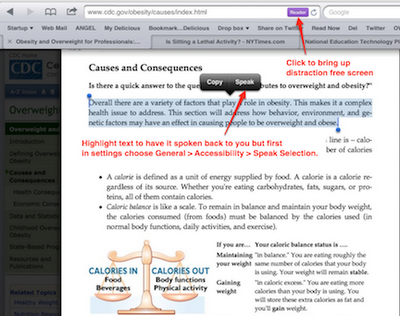 When you open each category in Reader, the information is updated locally on your iPod. You can then take these stories with you to read off-line - simply ignore any not-connected error and continue reading. NetFlix Subscribers have essentially the same functionally as the full web browser version (manage your NetFlix DVD and Instant queues, view Recent activity such as when your next DVD's will ship, etc.) and can instantly watch TV episodes and movies streamed from Netflix on their iPad in full screen. The quality is excellent and the experience is superb. Evernote If you have not already done so create a free Evernote.com account and download the Windows or Mac desktop application. (The web browser works well enough when the full application is not available.) Use Evernote to create notebooks of just about anything digital that you can imagine: images, audio uploads, PDF's, web clippings, and of course your text formatted notes. The Evernote apps allows you to access your notes online and add text, voice notes, and images from your iPad Photo library. DropBox – Go to http://dropbox.com and create an account. Install the software on your PC or Mac and place documents that you want to sync to your server account (2GB) into the Dropbox folder. When you edit a file locally it syncs to the server. If you install DB on another personal computer, then it will sync from server to the DropBox folder on that computer. Dropbox displays iPad compatible file formats (e.g. images, music, Office and iWork documents, rtf, and html) stored on your share and provides tools to open them into apps such as GoodReader, Keynote, and Pages. Read these top five uses of Dropbox including copying PDF documents to a special folder (e.g. ebooks) and then marking them as favorites for off-line reading. Twitterific There are many Twitter clients for iPhone and iPad and choice is often based on personal preference in addition to features. I like Twitterific because it is visual attractive, easy-to-use, and includes . For example tweets are color-code by mentions, replies, direct messages, and personal tweets. Clicking a tweet's embedded URL opens the page within Twitterfic's own pop-up browser. Clicking the Done button returns to the active tweet. Speak-It! Type or copy and paste text in the "text to say" window and have a synthesized voice speak back to you. You can choose from two American voices (good quality) and two British voices (better quality), increase or lower the volume, and adjust the playback speed. Text can be saved as phrases for future retrieval and then exported as a TTS audio file, which can be e-mail for storage and retrieval. There are a number of application for Speak It! including hands-free listening of online news, playing back text for those who are unable to speak, and assisting auditory learnings with reading text. For long text such as chapters and books, I recommend a solution such as iSpeak It and iTunes. WordRefer – Web app that accesses the http://wordreference.com web site. Excellent resource for translating words between languages (e.g. English, French, Italian, Greek, Spanish, and Japanese), providing many example idiomatic expressions based on the word, and conjugating verbs. Users can also join a Discussion forum to pose questions about word usage in a given language. The app's design is average but provides an excellent reference and communication tool for language learners. SonicPics for iPod touch, iPhone, and iPad (although not yet native) is an elegantly simple, all-in-one mobile solution for creating audio slideshows — still images synced with audio as they relate to each image — that provide enhanced online and mobile learning opportunties for students as compared to audio only media. The slideshows can be exported as QuickTime chapter videos or uploaded directly to YouTube for instant sharing! SonicPics uses the iPad's built-in microphone and imports images from your iPad's Photo library. Even though the app is not yet native, SonicPics runs without issue on an iPad, which is a natural for annotating audio to images because of its larger screen and built-in microphone. For detailed information on SonicPics read Creating Collaborative Audio Slideshows. GoodReader - By now most everyone is familiar with GoodReader and would agree that it is the best available PDF reader for iPad. iBooks - Apple's ebook reader that requires a separate download with any new iPad. You can read, browse, purchase, or upload for free from a large library of books in ePub and PDF format. Be sure to install the latest update, which includes a note tool, flexible color highlighting, and bookmark syncing with iPhone/touches running iOS 4. Keynote - Keynote for iPad easily and quite accurately imports PowerPoint (Windows or Macintosh) and Keynote (Macintosh) presentations, especially when used with the Dropbox app. From your PC or Mac save your PowerPoint or Keynote presentation to a Dropbox folder (e.g. presentations), open Dropbox on iPad, load the presentation, and choose Open In Keynote, which automatically imports the file including presentation notes (available with the the November 2010 update). The process takes less than one or two minutes depending on the size of your presentation file. The optional iPad VGA adapter allows you to project your Keynote presentation, although it must be in play mode. During projection there is an option to split the iPad screen into the current slide with presenter notes. The projection monitor or screen will display the full slide. In addition the presenter can switch the time display between time elapsed or current time and press and hold down to activate an on-screen red laser pointer. Reeder is arguably the best and most full featured RSS Reader for the iPad, although app is $4.99. The iPhone version must be purchased separately. Reeder is actually a client for Google Reader and provides options for sharing through e-mail, Twitter, and Delicious bookmarking. NPR Music is one of the most recent apps that I have downloaded and already I have had the pleasure of discovering, reading about, and listening to several new music groups. You can explore genres by Rock/Pop/Folk, Jazz & Blues, World, Classical and Hip Hop/R&B and browse by Programs and artists. There are live performances, reviews, and interviews to supplement what you listen. Create your own playlist of performances that you want to quickly retrieve. PlainText - There are not many options to write data from your iPad directly to a Dropbox share. PlainText is one of them, although the app is limited to text only. When you link to your Dropbox account you typically designate a subfolder named Plaintext where folders and documents are stored. It is possible to edit the same document simultaneously (e.g. making changes from another iPad ). PlainText takes care of the merging and syncing for you. Great for taking notes at a conference or distracting free writing. Note: Habilis is an e-mail to DropBox gateway that allows you to e-mail iPad documents to a designated folder in your Dropbox share. For details go to http://www.gethabilis.com. Mint - Sign up for an account on Mint.com and connect to your online banking, investment, loans and credit card accounts for a quick check of recent transactions and balances. You authenticate through secure login credentials and then establish read-only access to transactions - money cannot be moved or transferred. Mint provides optional online money-management tools and options to send alerts based on transactions and status such as an account that is running low. Note: Mint is not yet iPad native. Flixster - Search for box office flicks, movies on DVD, and upcoming films that are still in production. The movies are rated using the Rotten Tomatoes or Netflix database and includes a video trailer, PG rating, length, and theatre show times in your area, which is adjustable by distance. Flixster has links to the movie web sites Rotten Tomatoes, Flixster, and Bing. Movies released as DVD's can be rented or purchased through a direct link to iTunes. View and managing your Netflix queue is missing in the iPad version but available for iPhone - iPod touch. PBS for iPad - Released this month PBS for iPad provides access to a selection of hundreds of videos from new programs and recent PBS archives such as Frontline, Nova, Masterpiece Theatre, and PBS Newshour. There is a short sponsor message each time the app is launched but otherwise all videos play without commercial interruption. The archive provides an invaluable resource for faculty and students, although it is unclear how far back the archives will continue to extend after live episodes pass. You can see a schedule of upcoming programs and episodes and bookmark what you have seen, and share videos on Facebook and Twitter. Thank you for a great list of apps for the iPad. I do not have one yet, but will probably be getting one soon. I will bookmark your blog to refer to. Thanks for taking the time to organize this resource!